While not all of our dogs shed with the same intensity, we dog owners all need to take active measures to prevent our cars and homes from being coated in dog hair. We love our dogs, but that doesn’t mean we want to be covered in their hair. So, what is the best dog hair remover? I used some of the top products on the market to clean my car and find out. What’s The Best Dog Hair Remover For You? A lint roller is a roll of tacky paper with the sticky side out. As you roll it over the surface of your clothes or furniture, the dog hair sticks to it. Once the sticky part is covered, you peel it off the paper and throw it away to reveal fresh sticky paper below. The lint roller is surprisingly useful for being such an old-school, low-tech solution. In addition to picking up hair, it picks up pebbles, dirt, and other debris. One of the highlights of the lint roller is that I could press it into hard to reach or small areas, and the sticky paper picked up the majority of the hair even without requiring me to roll it. The downside of the lint roller is that the sticky paper filled up fast, and I had to continually remove the outside piece to reveal the piece below. It was a slow process, and the trash built up quickly, which might be hard to stomach if environmental concerns are a top priority for you. Still, it is an effective, low-cost solution and could be the best dog hair remover for your situation. If you choose to go with this option, make sure to buy a lint roller made specifically for pet hair to make sure you have a strong handle and sufficiently sticky paper. Areas with light hair, soft or hard surfaces. 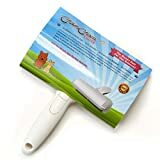 The ChomChom-Felt Roller is a lint roller alternative made specifically for pet hair. Instead of sticky tape, this roller uses a roller-brush with small fibers that clings to and collects the hair. It deposits the hair in a chamber so that you are able to empty it and reuse it again and again. The ChomChom-Felt Roller is designed to be rolled back and forth over the hair-covered surface to remove the hair. The roller didn’t collect as much hair from the seats as I had hoped. However, it worked wonders on the floor mat. The ChomChom-Felt Roller benefits from having a solid back to push against as you roll. The rolling motion feels natural and comfortable, and the hair collected quickly in the basin. This roller has the added benefit of giving a tremendous sense of satisfaction when you open the basin and see the amount of hair you’ve collected. The basin is extremely easy to empty, and cleaning can continue right away. Areas with hard backings – rugs, carpets, seat covers for hard chairs, etc. 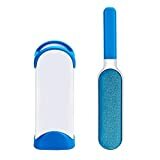 The Pet Hair Remover Brush is a wand with “brushes” on both sides. It’s not your typical brush, but rather a flat surface with short fabric-like bristles. The material is similar to that in the ChomChom Roller. To remove hair, use a swiping motion with against the direction of the bristles to pick up as much hair as possible. When one side is full, you can flip over the wand and use the other side. Once both sides are full, place the brush in the base to clean off the collected hair, and then continue using it. The base can be emptied as needed. Like the wand, this works best when you effectively press against the surface with a solid backing. I had difficulty with it on the seats of the car, but had great success with it on harder surfaces. Because of the sweeping motion, it is best on larger areas because if an area is too small, you won’t be able to move it sufficiently to pick up the hair. It’s worth mentioning that it is two pieces, and if you lost the base, the wand would be extremely difficult to clean. Areas with hard backing that are large enough to allow for a sweeping motion. A vacuum is a great option to remove dog hair because you probably already have one. If you don’t already have a vacuum you love, check out some of our recommendations to make sure you choose one that is great for dog hair. I used my Dyson V8 Animal, and it worked beautifully. Vacuums come in all shapes and sizes, but a high powered, cordless vacuum with attachments will be one of your best dog hair remover tools. You can remove a lot of hair before your need to clean or empty your vacuum, and the attachments make it so your can clean areas that would be otherwise difficult or unreachable. Depending on the attachment you use, you can use your vacuum for large spaces like your entire carpet, small spaces like between seats, or hard to reach spaces like under beds and chairs. There’s no silver bullet when it comes to choosing the best dog hair remover. You will likely need more than one of these tools in your tool belt to keep your home and car clean. Think through where your biggest pain points are where you are most desperate for a dog hair remover tool. If it’s a soft-backed surface, you might lean towards a lint roller or vacuum. If it’s a hard-backed surface, consider the ChomChom Roller or Pet Hair Remover Brush. Consider, also, when you plan to do your hair removal. If it’s Saturday morning when you have plenty of time to clean, the vacuum may be your team captain. If you want something you can keep handy to use right before someone comes over or gets in your car, you might consider a lint roller or the Pet Hair Remover Brush, which are both small enough to keep tucked away in your living room or car. As long as you think through your lifestyle and your goals while looking at your options, you are sure to find the best dog hair remover for you! One of the best ways to manage dog hair is to prevent it in first place! To prevent excess dog hair from covering your furniture, brush and groom your dog regularly. That way, the hair comes off when and where you want it to – not all over your car and house.